Grimme and Bannwarth presents the xTB method, a modified DFTB2 (SCC-DFTB) method combined with Grimme's simplified Tamm-Dancoff approximated (sTDA) TD-DFT procedure for the rapid calculations of electronic spectra. The two main modifications are 1) the addition of diffuse basis functions for some elements to accurately describe Rydberg states and 2) the SCF is replaced by a single diagonalization and the atomic-charge dependent term is evaluated only once using specifically designed charges. The method is parameterized against CC and DFT calculations for all elements up to Zn and more elements are in the works. SCS-CC2/aug-cc-VXZ (X = T or D depending on molecule size) vertical singlet-singlet excitation energies are reproduced with a MAE of 0.27 eV. For comparison, the corresponding MAEs for TD-PBE/def2-TZVP and TD-PBE0/def2-SV(P) are 0.67 and 0.31 eV. The method also yields reasonably accurate ECD spectra. The method is quite fast requiring only a few minutes of CPU time for molecules with 500-1000 atoms. A very recent paper uses an as-yet-unpublished variant called GFN-xTB to perform an single point calculation on a P450 enzyme (7,500 atoms) without recourse to fragmentation. 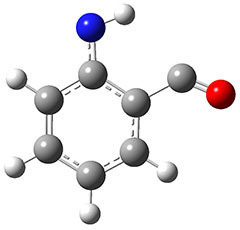 Reva and McMahon report a very nice experimental and computational study implicating hydrogen atom tunneling in the rearrangement of the nitrene 1 into the ketene 2.1 The reaction is carried out by placing azide 3 in an argon matrix and photolyzing it. The IR shows that at first a new compound A is formed and that over time the absorptions of A erode and those of a second compound B grow in. This occurs whether the photolysis continues or not over time. IR spectra were computed at B3LYP/6-311++G(d,p) for compounds 31 and 2 and they match up very well with the recorded spectra of A and B, respectively. The triplet state of nitrenes are typically about 20 kcal mol-1 lower in energy than the singlet states. The EPR spectrum confirms that 1 is a triplet. So how does the conversion of 31 into 2 take place, especially at 10 K? The rate constant for this conversion at 10 K is estimated as 1 x 10-5 s-1, which implies a barrier from classical transition state theory of only 0.2 kcal mol-1. That low a barrier seems preposterous, and suggests that the reaction may proceed via tunneling. This notion is supported by the experiment on the deuterated analogue, which shows no conversion of 1–D into 2–D. The authors propose that 31 undergoes a hydrogen migration on the triplet surface through transition state 34 to give 32, which then undergoes intersystem crossing to give singlet 2. The structures of these critical points calculated at B3LYP/6-311++G(d,p) are shown in Figure 1. The computed activation barrier is 20.7 kcal mol-1. (The barrier height ranges from 16.7 to 23.0 with a variety of different computational methods.) This large barrier precludes a classical over-the-top reaction and points towards tunneling. The barrier width is estimated at about 2.1 Å. WKB computations estimate the tunneling half time of about 21 min, somewhat smaller than in the experiments, and the estimate for the deuterated species is 150,000 years. Figure 1. B3LYP/6-311++G(d,p) optimized structures of 31, 32, and the TS 34. 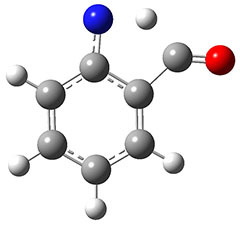 1) Nunes, C. M.; Knezz, S. N.; Reva, I.; Fausto, R.; McMahon, R. J., "Evidence of a Nitrene Tunneling Reaction: Spontaneous Rearrangement of 2-Formyl Phenylnitrene to an Imino Ketene in Low-Temperature Matrixes." J. Am. Chem. Soc. 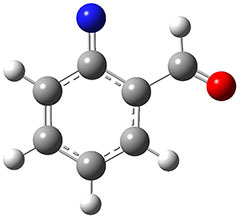 2016, 138, 15287-15290, DOI: 10.1021/jacs.6b07368.